In 1996, Lansdorp and coworkers showed that a modified DNA molecule called peptide nucleic acid (PNA) can be used for quantitative in situ hybridization. The key difference between DNA and PNA is the replacement of the classical phosphate-sugar backbone in DNA by repeating N-(2-amynoethyl) glycine units linked by peptide bonds in PNA. Different bases (purines and pyrimidines) are linked to the PNA backbone by methylene carbonyl linkages. Because PNA backbone is not charged, the binding between PNA/DNA strands will be much stronger than between DNA/DNA strands, i.e., there will be no charge repulsion between PNA/ DNA strands. Therefore hybridization between telomeric PNA probe and telomeric chromosomal DNA will minimize hybridization problems encountered when hybridizing molecules of the same charge, thus leading to higher hybridization efficiency. When the fluores-cently labeled telomeric PNA probe is hybridized with metaphase chromosomes then all telomeres are visualized and by using appropriate software, the fluorescence intensity of each individual telomere can be accurately calculated. 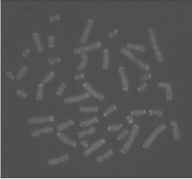 [8'9] This is a big advantage in comparison with Southern blot, which can only measure the average telomere length. Finally, because of its higher hybridization efficiency relative to DNA, PNA telomeric probe does not bind to degenerate telomeric sequences in subtelomeric chromosome regions. Therefore all three major problems associated with the classical telomere length measurement based on Southern blot analysis (see above) are eliminated by the new Q-FISH protocol, suggesting that this is the most sensitive method for measuring telomere length.